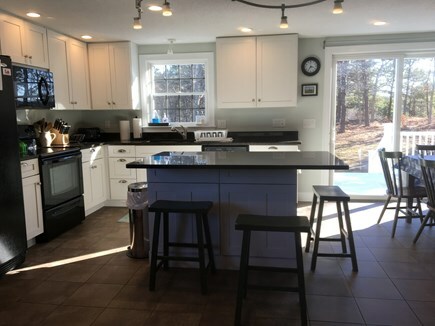 Bright sunny kitchen with sliding door out to deck . 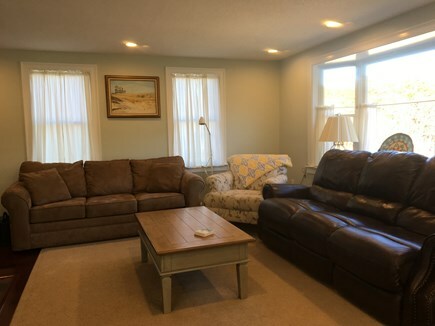 Our house is conveniently located on a quiet cul-de-sac and has a large deck with an outside shower, gas grill, table, chairs, and a retractable awning. A trail out back of the house leads to conservation walking trails that are great for morning walks or jogs. 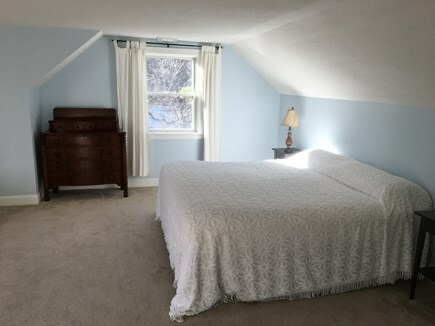 Walkout basement has washer and dryer and plenty of room for storing your bikes or kayaks. 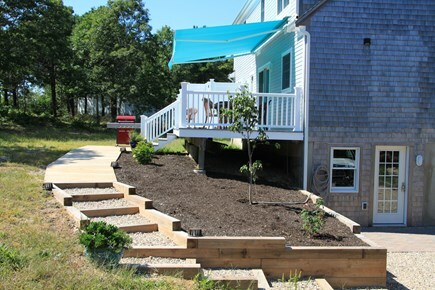 Large driveway to accommodate your boat and trailer. The house has central AC, a flat screen TV, stereo, and DVD player. 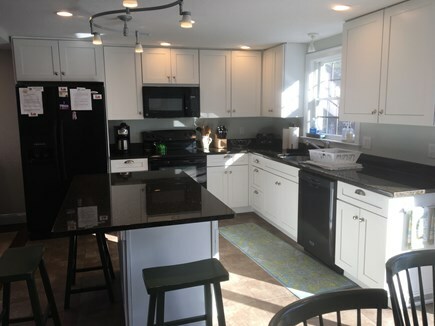 The kitchen has an electric stove, a frig with water and ice dispenser, microwave, dishwasher, coffee maker and toaster. The home provides pillows, linens, blankets, bedspreads, towels and kitchen towels, sponges, dish soap, trash bags, etc. 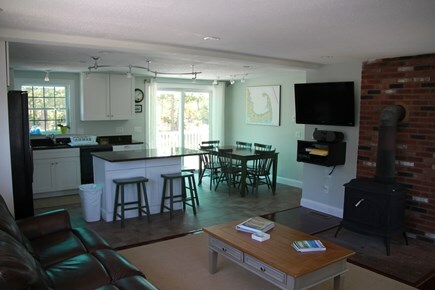 The main floor has open floor plan, kitchen dining room and living room. 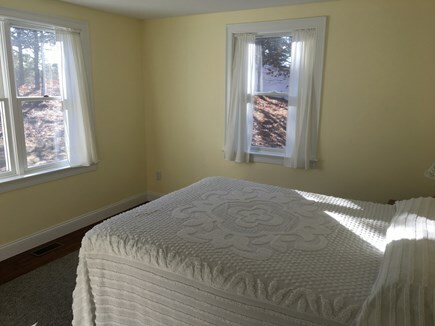 The two downstairs bedrooms have queen size beds. Upstairs has a full bath with double sinks, one bedroom has a King size bed, and the other bedroom has two twin beds. For the beach: beach chairs, beach towels, umbrella, and 2 large coolers and beach bags are provided. 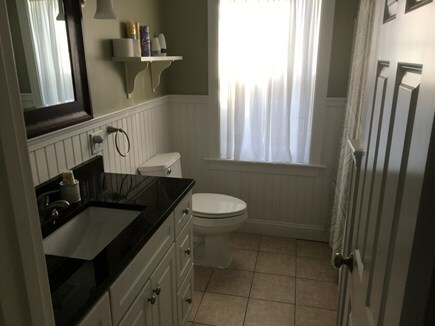 I've rented cottages in Eastham for over 25 years and stayed in some lovely (and a couple not-so-lovely) places, but this rental is by far the best in every single category you could think of! The two previous reviewers leave me with nothing else to say other than: "YES!" 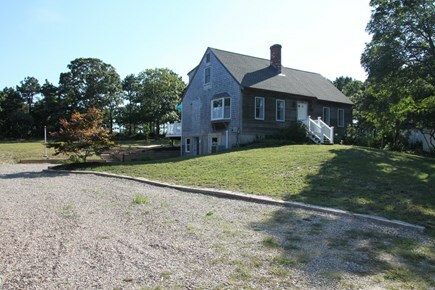 Our family had been renting in Eastham for several years, but the house we used was no longer available. This rental looked good and we were not disappointed. The house is quite new, very clean and well maintained. Not only is it well furnished both in the kitchen and the other rooms, but the owner offers several amenities not typically available. You need not bring linens and towels as they are provided and you do not have to wash them at the end of the week; that is part of the rental. Beach equipment is also provided including towels--you do have to wash those--, coolers, chairs, umbrellas and the like. Many things that you do not have to pack and bring with you. 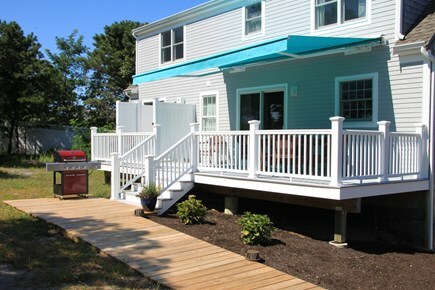 There is a large deck with dining room for 6-8. 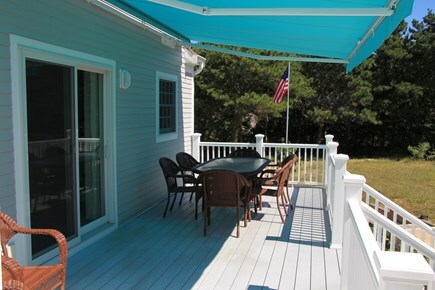 The deck has a retractable awning which is nice as there is not natural shade. 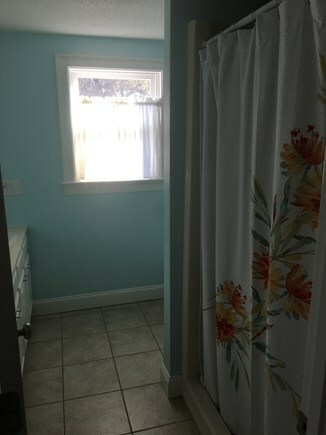 The outdoor shower is very clean and placed on the deck. It is a real shower not just a hose contraption. The house sits on a large lot with a wonderful wooded area for the kids to explore. Being at the end of a cul de sac, the house is very private and has good outdoor lighting. One other very nice feature is that the door has a electronic lock with a code that you cannot forget. It is very nice not to have to carry extra keys while on vacation. There were six of us including 9 year old twins and we were quite comfortable in the house. We would recommend this house without reservation, just not for our week. This house was immaculate and FULLY furnished! All new appliances from microwave to a mini food chopper. The little touches like dish sponges and trash liners when arriving were appreciated. The rooms were spacious and the beds comfortable. No waking up with stiff backs! Central air was awesome. We enjoyed sitting on the deck under the awning. Our kids loved exploring the vast untouched landscape behind the property. We also very much liked having beach chairs, totes and towels at our disposal. The house is close to Marconi Beach, which was gorgeous. 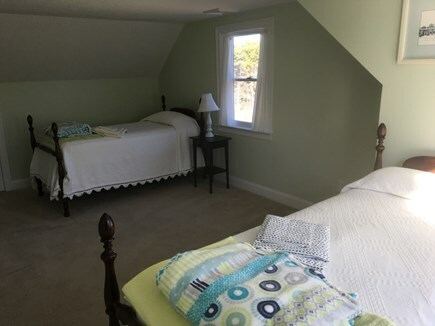 Our house is conveniently located to Bay and Ocean Beaches including the National Seashore, Coast Guard, and Nauset Light Beach. Just down the road is the Audubon Society which has several walking trails for bird watching and enjoying nature. There is 22 miles of Cape Cod Rail Trails for biking, many fresh water ponds. There is the Wellfleet Flea Market by day and the local drive-in movies at night .You can take a trip down to Provincetown for the day . There are restaurants, take out places ,fish markets, banking, and near by Harbors for your boat. 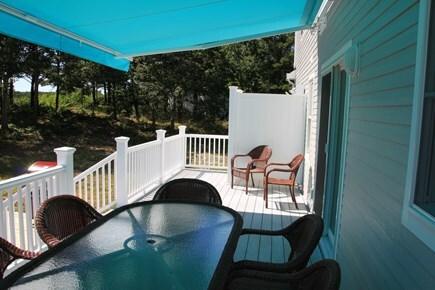 After fishing, biking, kayaking, hiking, or the day at the beach, come home and take a nice outside shower and relax on our peaceful back yard deck to plan your next adventure of beautiful Cape Cod .